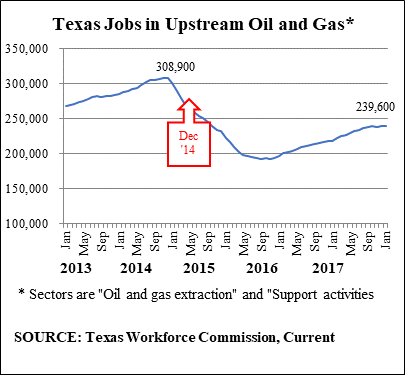 AUSTIN – Upstream* oil and natural gas employment continued to grow in January 2019, according to data from the Texas Workforce Commission (TWC). TWC data shows that while employment in oil and natural gas extraction and supporting activities fell by 1,900 jobs in November 2018 compared to October, upstream employment rebounded with a 1,300 job gain in December and another 100 job gain in January 2019. Beginning in December of 2016, upstream employment grew every month except in November 2018, making 25 months of growth out of a total of 26 months since the recovery began. Texas has recovered 41 percent of jobs lost between the high point in employment in December 2014 and the low point in September 2016. Since the low point, employment in the Texas upstream sector has grown by 47,200 jobs.